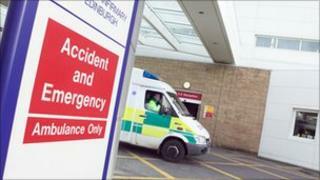 Image caption Ambulances and A&E performance was affected in the bad weather. No English ambulance service met the NHS target for responding to urgent calls last week as the bad weather hit. The target is for ambulance trusts to reach 75% of "category A" calls within eight minutes. But during the week ending 5 December none did, with the North East Ambulance Service reaching just 49% of calls within the target time. It was one of the ambulance services which had to draft in 4x4s to help out. Overall, 62% of category A ambulance calls were responded to within the eight minute target and 83% of less urgent category B calls were attended within the 19 minute target. This compares with 73% of category A and 90% of category B in the previous week. The target is for 95% of category B calls to be attended within 19 minutes. The Department of Health for England said the disparity was "likely to be due to the adverse weather conditions". It is publishing weekly data on its 'Winterwatch' website, collating NHS data in areas such a flu, winter vomiting virus - and ambulance and A&E performance. Health minister Simon Burns said: "A transparent NHS is a safer NHS, and that's why we're making this data available." Many A&E units also struggled to meet the four-hour target to see and treat patients, reduced this year by the coalition government to 95%. This was despite a fall in the number of people attending A&E, the figures showed. There were 361,500 attendances in the week ending 5 December, with 93,300 emergency admissions. Both figures were 6% lower than the previous week. A spokesperson for the Royal Victoria Infirmary A&E department in Newcastle, said: "Over the past three to four weeks there has been about a 10% increase in people coming in, compared to last year. "Last Monday, there was about a 30% increase alone. "For winter related injuries, they are mainly ankle fractures, head injuries and chest injuries from falling. "The patients are mainly the old and vulnerable and the injuries can be quite nasty. One man fell and hit his head and received a blood clot on his brain as a result." Why do schools shut when it snows?